The DCX MMXVI World Tour was the fifth headlining concert tour from American country music trio Dixie Chicks. It started on April 16, 2016, in Antwerp, Belgium and finished on April 18, 2017, in London, Ontario, Canada. This tour is the first time in ten years the band has toured the United States and Australia as a headlining act. It is the first time the band will perform in New Zealand. For the shows in 2017, the tour was renamed the DCX MMXVII World Tour. The sound of the show is more guitar and rock and roll driven than earlier shows, with re-worked Dixie Chicks classics and several covers by Patty Griffin, Lana Del Rey, Beyoncé, and Bob Dylan. Through large video projections several political and empowering messages are spread. In June 2015, the group announced that they would tour Europe in April 2016, additional dates were announced in August. North American dates were announced in November 2015. Due to demand additional North American dates were announced on May 2, 2016. The Oceania leg was announced in October 2016. The stage is set up as a classic stage with a big bars-shaped light rail that is pulled up during the opening song, revealing a large video screen. The Dixie Chicks are supported by a big band with a strong rock and roll sound. After a warm-up song, the band starts with a strong guitar version of "The Long Way Around", following "Lubbock or Leave It" featuring a trucker and rock and roll themed video. After the first of several Patty Griffin covers, a slowed down version of "Easy Silence" is performed with slow landscape shots and on-screen lyrics. After "Favorite Year" and "Long Time Gone", an acoustic cover of "Video Games" by Lana Del Rey follows. "Goodbye Earl" is another renewed version into a more guitar driven sound. During "Goodbye Earl" a video on domestic violence is shown, including Chris Brown, the Fritzl case and Donald Trump. A video interlude shows The Dixie Chicks in a video game-themed car race, while the instrumental cover of "Ace of Spades" is heard. The show is split with a bluegrass acoustic segment, starting with "Travelin' Soldier", played by only the three core members of the band. After "Don't Let Me Die in Florida" and "White Trash Wedding", the touring band is introduced. The acoustic segment is closed with an instrumental medley, including Beyoncé's "Single Ladies (Put a Ring on It)" and "Seven Nation Army" by The White Stripes. "Ready to Run" is themed as an election year parody, with a montage of Hillary Clinton and Donald Trump, while confetti is blown over the audience. Two more covers are performed: Bob Dylan's "Mississippi" and their version of "Landslide" by Fleetwood Mac. After "Silent House", "I Like It", "Cowboy Take Me Away" and "Wide Open Spaces" the show is concluded with "Sin Wagon". The encore starts with a dark version of "Not Ready to Make Nice" and a final encore is a positive and empowering message from Ben Harper's "Better Way", closed off by a drum segment. At the last show in the US on October 10, 2016, Natalie Maines announced: "As you can see we've chosen you guys and the forum to be the audience for our DVD". The Edmonton, Calgary, Los Angeles, Melbourne and Hamilton shows were included in a one-night cinema event DCX MMXVI Live that was shown in theatres on August 7, 2017, followed by a DVD/Blu-ray/CD release on September 1, 2017, from Columbia Records. "Everybody Knows" | "Favorite Year" | "Some Days You Gotta Dance"
"Video Games" was replaced with "Nothing Compares 2 U" starting in Horsens. "Daddy Lessons" was performed in Manchester, Glasgow, Pittsburgh, Camden, Toronto, Hershey, Vancouver, Auburn, Irvine, Dallas, Houston, Tampa, St. Paul, West Valley City, Mountain View, Raleigh, New Orleans, Melbourne, Brisbane and Sydney. Something in the Air, a cover from Thunderclap Newman, replaced "Video Games" and "Nothing Compares 2 U", starting in New Zealand, 2017. ^ The August 27 and 28, 2016, concerts in Falcon Heights are part of the Minnesota State Fair. ^ The March 26, 2017, concert in Willowbank is part of CMC Rocks. Anastasia Verleysen of the Het Nieuwsblad says, "The Dixie Chick are not just singing some country, but ladies with balls on their backs and even a high rock 'n roll content. And yet, their songs always go back to basics with the nonchalant banjo-strumming Emily Robinson, Martie Maguire handsome violin lines and the impressive voice of Natalie Maines." The Daily Telegraph's Sarah Carson stated, "the triumphant trio proved the power lies in their musicianship, not notoriety, and their talents remain as rich and fierce as ever." Erik Leijon for Montreal Gazette wrote about the 2017 leg of the tour: "Saturday night's set was a reminder that beyond having the courage to speak openly, the Dixie Chicks possess the heart-stopping harmonies, bluegrass stompers, superstar presence and enviable pop instincts to back up any words." ^ "Dixie Chicks To Launch North American Tour Next Summer". The Huffington Post. Associated Press. November 16, 2015. Retrieved January 23, 2016. ^ a b "MMXVI TOUR HAS BEEN EXTENDED!". dixiechicks.com. Dixie Chicks. May 2, 2016. 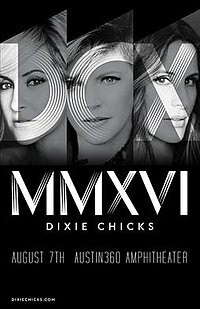 ^ a b "Dixie Chicks Will Headline The Mission Estate Concert". eventfinda. Eventfinda Limitied. October 13, 2016. Retrieved October 26, 2016. ^ a b Horton, Carrie (October 18, 2016). "Dixie Chicks Announce 2017 Australian Tour Dates". The Boot. Taste of Country Network. Retrieved October 26, 2016. ^ "MMXVI NORTH AMERICAN SUPPORT ACTS ANNOUNCED!". dixiechicks.com. Dixie Chicks. May 2, 2016. ^ a b Verleysen, Anastasia (April 22, 2016). "Parts Tweet Google+ Mail shares REVIEW. Dixie Chicks lead country with balls". Het Nieuwsblad. Media Hus. Retrieved May 1, 2016. ^ "Dixie Chicks Setlist at Hallenstadion, Zurich, Switzerland". setlist.fm. Setlist.fm. Retrieved May 1, 2016. ^ "Dixie Chicks announce 2016 world tour". countrymusicontour.com. countrymusicontour.com. Retrieved June 23, 2016. ^ McClellan, Laura. "Dixie Chicks Performs Heartfelt Rendition of Prince's 'Nothing Compares 2 U' [Watch]". Taste of Country. Taste of Country Networkd. Retrieved April 26, 2016. ^ "Dixie Chicks Setlist at Oslo Spektrum, Oslo, Norway". setlist.fm. setlist.fm. Retrieved May 1, 2016. ^ Romano, Nick (May 1, 2016). "Dixie Chicks cover Beyoncé's 'Daddy Lessons' at Manchester concert". Entertainment Weekly. ^ Betts, Stephen L. "Dixie Chicks Announce Summer 2016 U.S. Tour". Rolling Stone. Rolling Stone. Retrieved January 23, 2016. ^ Carson, Sarah (April 30, 2016). "Dixie Chicks make a headlining UK return after 13 years – review". The Daily Telegraph. Retrieved May 1, 2016. ^ Leijon, Erik (April 18, 2017). "Concert review: Dixie Chicks still not backing down". Montreal Gazette. Retrieved April 24, 2017. This page was last edited on 8 April 2019, at 02:30 (UTC).